We’re starting the new year with a client spotlight on Jay Valento, part of The Red Wagon Team in Southern California. Jay uses our dsIDXpress plugin to add listings to his active WordPress blog redwagonteam.com, making for a very content-rich resource for buyers, sellers, and search engines. Often using listing data from dsIDXpress as a springboard for writing topics, Jay’s blog has received top placement for the Long Beach real estate market by search engines and blog ranking sites. 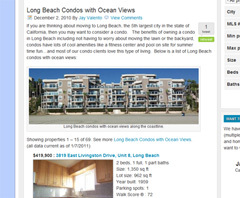 His blog is filled with short but informative articles like this one about a new condo building in Long Beach: http://www.redwagonteam.com/long-beach-neighborhoods-ca/marina-pacifica-condos/ Here he just has a snippet of information about an area along with dsIDXpress shortcode to generate all the active listings there. It’s easy but effective; a perfect example of how shortcode can be used to add listings to pages and guarantee fresh content. His blog homepage features the latest articles and blog posts he has made, along with a large quick search widget, map widgets, and even some dsSearchAgent modules for quick listing access and visitor engagement. With a list of targeted cities along the right-column and popular neighborhoods and zip codes across the bottom – all linking to articles and dsIDXpress content – his blog is very SEO and user friendly. We encourage you to take a look at the layout of Jay’s blog and read some articles for inspiration for your own site and blog. Keep up the great work, Jay! Very cool and great use of the technology. We finally went live yesterday with a little bit of everything on a WordPress/Studiopress/idxPress site. I’ll be continuing to tweek so it’s great to see what others are doing. @Clint Glad to hear people are getting ideas out of these posts! Good luck with your new site! As always, anyone can feel free to drop us an email at [email protected] letting us what cool ways you are using our products to be considered for our blog series here! I love the look and feel of Jay’s site! For anyone looking for Long Beach homes or for any real estate in that entire area, it is the GO TO site for up to date real estate information. Kuddos to their team for all the work they put into being THE real estate team in the area. Thanks Nick for the glowing evaluation…. Very nice site. I got some great ideas for future upgrade projects. Have a prosperous 2011!